Centralization has always been an issue in the Bitcoin ecosystem. The original spirit of the currency, as envisioned by its early adopters and its founder Satoshi Nakamoto, features a distributed network of independent miners, a peer-to-peer community of users trading bitcoins for products and services with each other over the internet and an unprecedented stability and universality arising from the currency not being dependent on any one currency or government. By the middle of 2011, however, it became clear that this was not at all the case – what we got instead is an oligopoly of mining pools, a Bitcoin exchange market dominated by a seemingly immovable monopolist, and a hopelessly intertwined connection with the United States and its dollar. Many have been unhappy with such a state of affairs ever since it developed, although others argue that it is the optimal level of centralization decided on by the free market and the best exchanges and pools deserve their market shares for providing a superior quality of service. For the longest time, this state of affairs remained. Tradehill came and went, Deepbit remained as strong as ever, and MtGox’s market share was progressively increasing all throughout the latter half of 2011. More recently, however, the free market has begun to take another course. Data from the past year shows that three types of decentralization have all been taking place in the Bitcoin economy since roughly the beginning of 2012: the decentralization of exchanges, the decentralization of currencies and the decentralization of pools. We see a rapid decline in MtGox’s global market share, bringing the exchange down to a level unseen since 2010. The causes of this are twofold. First, MtGox’s popularity itself is decreasing. The main reason for this is that the main barriers to entry that had been cementing MtGox’s monopoly throughout 2011, deposit and withdrawal options and liquidity, have both been solved. Through BitInstant, MtGox, CryptoXChange, Virwox, Bitstamp and BTC-E are able to process essentially the same array of fiat deposit and withdrawal options. As for liquidity, while in 2011 one could often expect some exchanges to have prices that differ from each other by as much as 5% and ask-bid spreads that are even greater, now an increasingly more advanced arbitrage market is effectively removing both of these efficiencies. More recently, MtGox has been having some recent difficulties processing withdrawals, and this has also added to the shift in market share as users move to other exchanges where they feel that they can get their money faster and more safely. The ever-present fear that MtGox is secretly operating with a fractional reserve also tends to intensify during crises such as this one, driving users to move their funds elsewhere. Second, the prime importance of the US dollar itself is decreasing. While MtGox’s popularity even among USD exchanges has decreased considerably over the past five months, an equally important cause of its decline is the fact that in non-USD markets, which are growing in importance, MtGox has never been that strong in the first place – its market share there has never consistently been above 30%, and it too has decreased from about 25% to about 18% over the past eight months. Finally, there is the decentralization in pools. 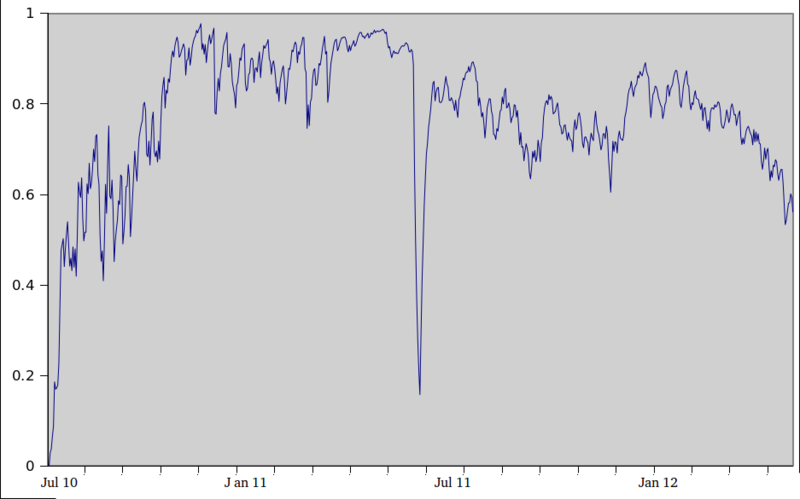 The above charts show the slow progression of the mining pool network from July 2011 to now. One year ago, the Bitcoin network was so centralized that if the then two largest pools, Deepbit and Slush, were to coordinate they could potentially pull off a 51% attack, and over the past six months especially the market share of the top two has been consistently on the decline. It can be justifiably argued that the owners of the two pools never had that much power in the first place, as whenever Deepbit’s hash power threatened to exceed 50% miners tended to quickly switch to other pools, but whether the state of affairs of one year ago was merely slightly undesirable or a critical source of instability it cannot be denied that the fact that the market is moving toward a more decentralized structure is an improvement. There are other signs of improvement. In 2012, alternative clients like Electrum, Armory and Blockchain have finally become credible alternatives to the Satoshi client, and the Bitcoin economy is even decentralizing by industry as the financial sector slowly begins to take a back seat. The failure of Bitcoinica, the then second largest business in the Bitcoin economy, followed by a mere 4% decrease in the Bitcoin price and soon after a rapid correction and even reversal, is ample proof of this. The period of the Bitcoin economy being held hostage by capricious individual bottleneck providers is finally at an end.